It can connect to any host with Standard A or Type C connectors providing a fully backward-compatible and future proof docking solution. Allow you to connect up to two additional monitors and eleven accessories through a single USB cable. •MacOS 10.13.4 no longer supports DisplayLink. Turn off automatic updates to remain on 10.13.3. - Dual 4K HDM / 4K HDMI + 4K DisplayPort :The maximum resolution will be 3840x2160 (UHD) if both video outputs are being used. - Built 10/100/1000BASE-T Gigabit Ethernet RJ45 f,Wired network connections are faster and more reliable than any Wi-Fi. - With separate microphone input and amplified audio output,you can enjoy crystal-clear conference calls or any other project benefits from having your voice heard. - 6 x SuperSpeed USB3.0 ports provides up to 5Gbps data transfer speeds, which is 10 times faster than USB2.0. - Supports 5.1 Channel Surround Sound,supports Extend and Mirror Video Mode. -Compatible with both Type-C and Type-A Laptop/Desktop Windows&XP system, limited support for Mac OS. Supports resolutions up to 5K (5120 x 2880@60Hz) single display when using dual DisplayPort ports / dual 4K HDMI / 4K HDMI + 4K DisplayPort output.1x DP(Singer Mode DP1.2) support resolution up to (4K)4096 x 2160@60Hz,1x HDMI(Singer Mode HDMI2.0)Support resolution up to (4K)4096 x 2160@60Hz. Full Compatible with Microsoft Windows/ 7/ 8/ 8.1/ 10.No support on Mac os 10.13.3 or later.No support on Linux/Unix or ARM based Windows operating systems (such as Surface RT). Gigabit Ethernet network RJ-45 backward 10/100/1000 Ethernet, 2CH Audio Line-out Jack for Earphone and Line-In Jack Microphone.6 x USB 3.0 ports compatible all USB 3.0 and USB 2.0 devices.The Most Versatile Dock Ever,15 ports of incredible connectivity give you all your needs in a sleek, compact design. 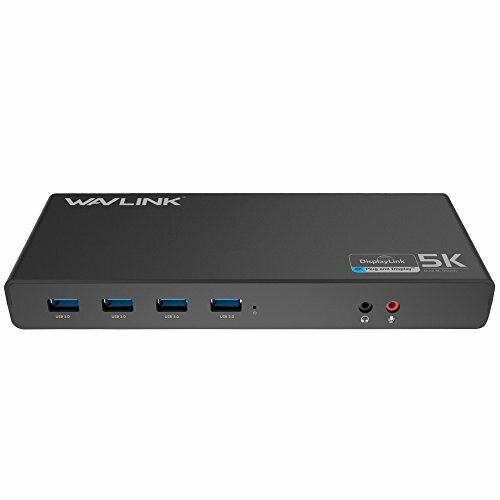 Please note:①This Wavlink Dock can not supply power for PC ②Your DP/HDMI cable must meet standard wire,otherwise it will affect the output monitor. ③Suggested for web/productivity software; not recommended for gaming.